What do I do if I need to order more than one boat name? To order more than one boat name simply click on the ‘Add to Basket’ button until you have the required number. How wide will my boat name be? 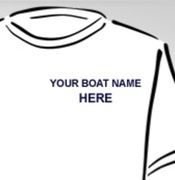 This all depends on how many letters your boat name consists of and which typeface you have chosen. Call us on 01590 688212 if you are concerned about this. Delivery normally takes between 3 and 5 working days. Please call us if you need your boat name faster than this and we will despatch it using an express delivery service (for a charge of Â£15 which must be paid with a credit card over the phone). How do I remove the existing boat name? Hairdryer and scalpel is quite effective. How do I apply the boat name? 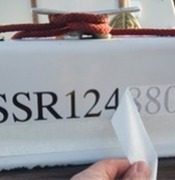 Applying a boat name is a task that requires a little care and attention, please see our application guidelines for a step by step guide. 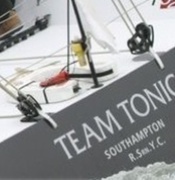 Can Wild Boat Names apply my boat name for me? 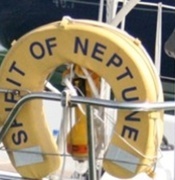 We are able to apply boat names for a variable cost based on your location, please call on 01590 688212 for a quote. Can I order a different colour T-shirt? Yes but there is a minimum order of 5 T-shirts. If I want to order a much larger quantity of T-Shirts what do I do? 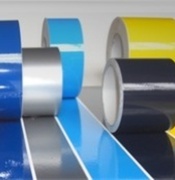 We can also source all sorts of branded clothing and wet weather gear so please do call us to discuss.